I read that as “Happy Monday” which is a nice sentiment as well. =) Happy Early Mother’s Day! Yes… that’s definitely a nicer sentiment. 🙂 Hope you have a great Mother’s Day, too! Happy early Mother’s Day to you, too, sweet friend! You too, lady. Hope you enjoy your special day! 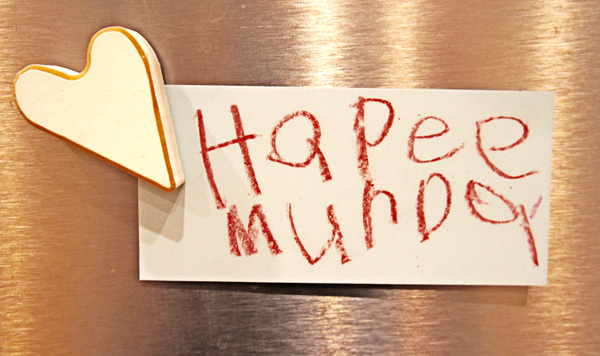 At least she didn’t write “REDRUM”. Ha, ha – she’s so cute. Happy Mondoy to you! Ha! I kinda thought of The Shining when I wrote this, too. 🙂 Yes, that would have indeed been creepy. Previous Previous post: C’mon baby, light my Kindle.